I want to start this review by giving the art team a big round of applause. This is one of those issues where the strength of the visual storytelling really kicks the whole story up to a whole new level of awesome. Paolo and Joe Rivera, together with Javier Rodriguez, do some serious (under)world-building and the result is something that feels both vast and claustrophobic at the same time. The scene below, which was also part of the preview for this issue, is a great example of the gorgeous artwork. Great attention to detail, superb use of shadows, and the color palette shows a contrast between the dark cold of the shadows and the heat of the lava pools that makes it feel real. Aside from the scenes deep below the surface, there were other little details I enjoyed as well. Something as simple as having Matt hold his shades in his mouth while changing in a back alley gives the scene a rushed feel to it, and the way Black Cat’s hand is used to demonstrate her hesitation in Matt’s apartment is brilliant. This is a book you can look at over and over and notice new things you like about the artwork. So, how about the story? One of the things that amazes me about the way Waid goes about writing every single issue is how well he manages to balance all the areas of Matt’s life. I was fully expecting this issue to be just about Matt versus Mole Man. But, it’s about much more than that. There’s a great scene with Foggy where Waid inserts some humor by having Foggy point out Matt’s footwear, and a scene with the Black Cat that makes sure we’re still keeping up with what’s going on with the Omega drive. 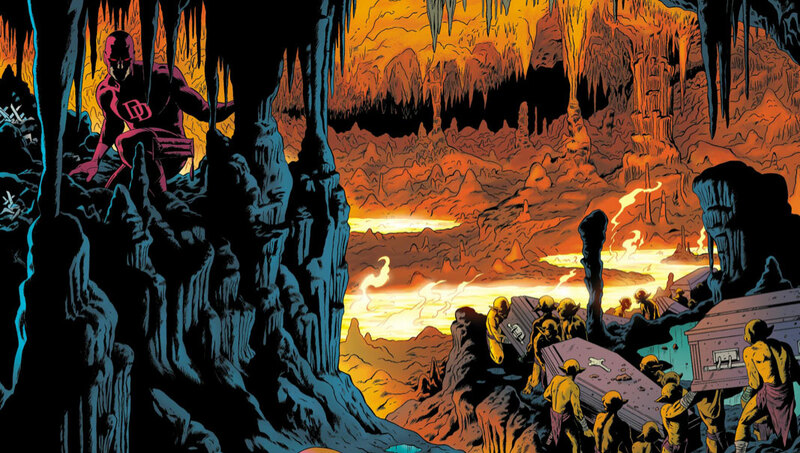 There’s also a great amount of depth to Daredevil’s underworld trek where Waid makes sure that the time spent going deeper below the surface is also spent getting a deeper understanding of Daredevil. As always, the writing (and visual representation) of Matt’s senses is stellar. Since Daredevil has never encountered a Moloid – or their ruler – and has obviously never seen a picture of them, he matches his experiences with these creatures to descriptions he’s heard and applies deductive reasoning to make sense of it all. This is also the first time in Waid’s run that we really see Matt lose his composure. The idea that the Mole Man is desecrating his father’s remains is too much for him to handle and he finally snaps. I love how this is such a personal story for Matt; in all of the high-adventure drama of superhero versus supervillain, this is also the tale of a man trying to save what little is left of his dead father. It makes the story feel like it really matters. Exactly what Mole Man is up to is not fully revealed this issue, but from the strong hints we get at the end, it looks to be something truly twisted. Daredevil, meanwhile, is facing a threat much bigger than he can perceive and the issue ends with a very literal cliffhanger. Words can’t even express how much I’m digging this book right now. Some reviews, albeit very positive, might lead uninitiated readers to believe that Daredevil is just about fun and high-stakes superheroics these days when it’s really about much more than that. Each and every issue is full of complex and in-depth character work and has enough layers to it to appeal to comic book fans of every persuasion. I can’t wait to see what gems will be revealed next issue. Don’t forget to check out the new interview with Mark Waid that CBR posted today! Chris Samnee joins Waid and Rivera on Daredevil! I suspect not, but when Mole Man started dancing, was anyone else reminded of “The Tick vs. the Mole-Men” from the “The Tick” cartoon series? It’s the Mole King in love all over again! I don’t know that episode Aaron (although I love the Tick ), but there is a song (and video) by Tom Petty called “Last Dance with Mary Jane,” that I thought of when Mole Man started dancing. I want to know who he dead woman was. An ol’ girlfriend of Mole Man? There was a panel when he opens the coffin and the woman’s face gives off some sort of radiance in that he recognized her. I’m beyond curious. @Clayton – I read an article at ComicVine.com that has a theory as to the identity of the mystery woman. I haven’t a clue if it’s right or not. @Arron K thank you so very much for that. I quite enjoyed that read even if it may turn out incorrect. I was looking to learn a little more about Mole’s history. I really loved this issue because it gave me a Daredevil Inc. type of vibe. Silver Age fun, but with modern spin much like Morrison’s Batman. Loving this!